Did you ever wanted to build your own kite? I recently published the plans for two of my tube kites on GitHub. 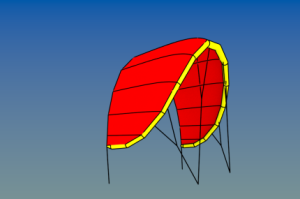 Beside the DXF kite plans you will find the 3D models (blender file) and all the technical data calculated by my WingCalc software http://www.wingworks.de/kite-design/3d- ... -wingcalc/. The GO is a my latest design and still in alpha stage. 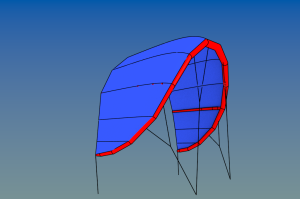 It's based on the Ventus but with 3-Struts and hence with a different canopy shape. You can build the first prototype and test and improove the design! Have fun and please feel free to send me your feedback, ideas, comments! that ventus looks like it will be sweet for hydrofoiling ! Excellent. I was just going to suggest using JSON to export, but then I saw it is at the top of your list. I think two things;;;the software is needed..unless I missed something I do not think there is any utility except looking at the designs without the software. Secondly someone needs to be able to print the actual kites in super small quantities. Neither of these should be impossible, but I bet pretty prohibitively expensive for the average guy. My sewing skills will never be good enough to make a kite. tautologies wrote: the software is needed..unless I missed something I do not think there is any utility except looking at the designs without the software. 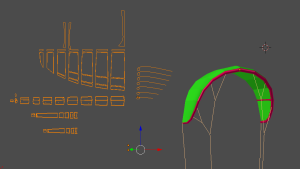 Beside the DXF kite plan there is always a *.blend file in the release package (Ventus-S_v1.0.zip). You can open it with the OpenSource Software "Blender" https://www.blender.org/ and view the 3D Model of the kite in detail. nice work! i am going to make one, i got the panels laser cut years ago using surfplan and sewed a 12m together but technology has moved on and for sure it will be better this time. tautologies wrote: What is the plan with the software? tautologies wrote: Are you going to help people to get to actually building a kite as well? haha no no you misunderstand...I'm not asking or help per se. I am sure there are enough tinkerers that are willing to pay a bit for a good software. I think the building of the kite is a business in it self. You "just" have make it cost efficient to do so at low volumes. People, I think, could be willing to pay for this service. I'm kind of suggesting you try to make it a business. You could pose the question here...what is it worth to people. If you give away the software..how many will use your services to actually print the kite. How many will use consultancy for the last percent. Etc. Anyways. I don;t know enough about the industry, but I assume most companies have prototypes made by the same factory that produce the whole lineup. I bet there are a lot of delays in this process..which is a cost..because the factories are generally set up for larger scale than one offs. 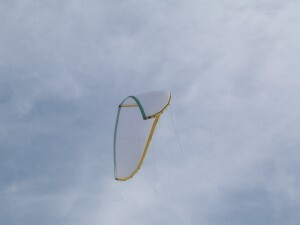 PanTau wrote: Did you ever wanted to build your own kite? 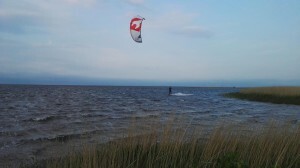 I was thinking there were only 2 kite design programs avaiable, SurfPlan from Australia and iKDesign from France http://wingdesignsoftware.net/indexEN.htm. Both sites seem to have stopped their news in .... 2013. To simplify the sewing process, have you ever tried to design a strutless kite ?